Jeff Nichols' sparse but potent body work has largely flown under the radar over the past decade, even though he's crafted these absorbing dramas powered by thematic ambiguity and tormented main characters, always with the stern, piercing features of Michael Shannon somewhere within. His work ends up having such an impact because he distills a lot of emotional and moral complexity within the scenarios he's written, which give his indie projects a kind of dramatic grandeur that stretches well beyond their budgetary means. Thus, those who have followed Nichols' work over the years were justified in getting excited for Midnight Special, in which the writer/director would point his energy toward a small-scale story about hiding a young boy with extraordinary, almost magical powers ... kinda like a superhero. Sadly, while Nichols' situational intimacy and gorgeous composition remain in this suitable science-fiction effort, a dose of uninspired, overly recognizable storytelling keeps it from reaching the same heights as his previous work. Midnight Special drops us immediately into the pursuit for young Alton (Jaeden Lieberher), who's holed up in a ramshackle hotel with his father, Roy (Michael Shannon), and their traveling companion, Lucas (Joel Edgerton). Ever monitoring the TV for updates on how much information the authorities have on them, they once again flee into the night after another escalation in the information released about them, desperate to keep the young boy safe. The reason? Alton has specific supernatural capabilities, ranging from tapping into hidden communications arrays to expelling energy beams from his eyes, not entirely unlike Cyclops from X-Men. While the government poses a threat to his safety, wanting to locate him for assumed reasons, they're also fleeing from a religious cult-like group -- led by Sam Shepard's Calvin Meyer -- who believe him to be the key to the fruition of their rapturous belief structure. As a result, Roy and Lucas are forced to do anything possible, crossing boundaries, to get Alton to a specific destination before time's run out. Midnight Special does get its hook in early with a crafty slow feed of details about the capabilities of the young boy, generating a compelling mystery that unravels in big, bold ways between the stretches of restrained exposition. Jeff Nichols' interest in ambiguity emerges in how he avoids direct explanations of what exactly Alton's powers are and what, precisely, all the information collected about the young boy -- both by the government and by the Mormon-esque quote who reveres him -- actually entails. Coupled with the character-driven focus established by Nichols, the film takes on a tone that's unmistakably inspired by the works of Steven Spielberg, a fusion of E.T. and Close Encounters of the Third Kind with how it snaps pieces of the puzzle together underneath an emotional momentum, with Star Trek: The Force Awakens' Adam Driver filling the role of the Richard Dreyfuss-type of expert as an NSA specialist. As Alton's eyes begin glowing and dumps of numerical data create an odd maze for Midnight Special to navigate, it's hard not to get intrigued with seeing what's at the end. 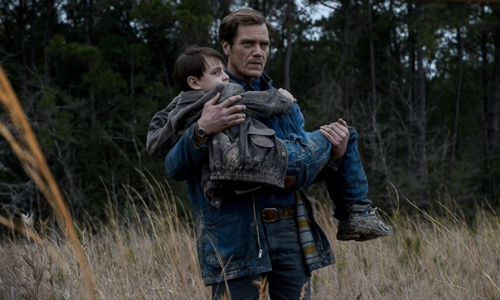 Much like his previous films, writer/director Nichols brings beautifully-shot, quaint rusticity and invigorated performances to Midnight Special, driven by Michael Shannon's hardened yet sympathetic protectiveness as the boy's father and Joel Edgerton's compromised perspective as a longtime friend. Nichols is also working with a premise that doesn't communicate as effortlessly with subtle, personal dramatics, and that shows once the film drags in the middle amid the protracted pursuits for Alton and the gradual connecting of the dots about the boy's purpose. Largely stoic underneath his blue goggles and orange headphones, Alton becomes more of a device for the plot's forward movement than a captivating character, whose bizarre verbal outbursts and dangerous energy projections rob the other characters of the kind of attention they'd need for actual depth. Familiar faces from Anton's past emerge in the roadtrip, including his mother, played by Kirsten Dunst, but these interactions seem more like interruptive stalling of a dramatic reveal than adding emotional depth to his escape from pursuers. Jeff Nichols' craftsmanship around the boy's escalating powers and inherent link to this cult becomes a source of wonder and amusement in Midnight Special, but that doesn't make up for the lack of thematic edge that traditionally commands the director's work, and it's not from an absence of potential. Ideas about religious belief, intercepted government telecommunications, and the morality behind protecting an individual like Alton at all cost present themselves in Nichols' script, but they're only developed to a superficial level, perhaps deliberately so in order to allow the audience to draw their own conclusions. That vagueness rings hollow, though, especially once all the pieces of data about Alton begin to snap together in the dramatic conclusion, amplifying the extent of his other-worldly capabilities as the rest of the characters bask in its amazement. Everything comes together in suspenseful fashion, but the boy himself possesses so much gravitational pull that the rest of the story's moving parts -- notably the other characters -- fade into the background. It's alien territory for Nichols, and his latest lacks that special something for it.